Stunt Maniac Game - FunGames.com - Play fun free games. Get ready to ride! 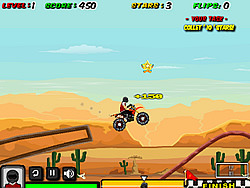 In this racing game, Race your motorbike over jumps and through rough terrain! Perform stunts and collect stars, Ever level has a fun game task. Finish the task to pass the level. Good Luck!